We’re excited to present the Bundy Trap Base Design, as this is our very first RUST trap base design, brought to you by our partner Malonik. This trap base design is part 3 of a fantastic series Malonik has put together. 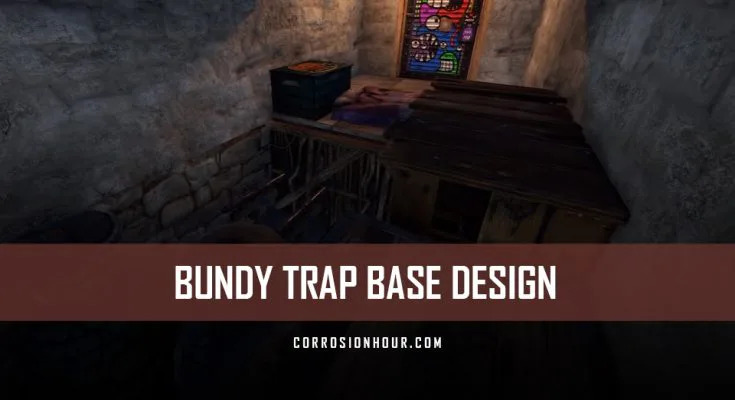 The most important aspect of the Bundy trap base design is that it’s an incredibly effective trap base. Being compact and simplistic help to make it more affordable. By far one of the cheapest and quick builds to set up. While testing this RUST trap base design, Malonik and crew were able to trap over 15 people in just about a day’s time. If you haven’t seen the videos leading up to the base design, here are some quick links. Be sure to check them out to get the scoop on the full story. Hey guys! Mal here and today I’m going to show you how to build the Bundy trap base. This compact and simple trap base managed to trap over 15 people across the day or so that we were using it. Not only that but as some of you would have seen in my previous videos it proved to be a pretty bad time for poor Bundy. Interestingly the majority of the people that we trapped with it seemed to think that it was actually an active base rather than an empty trap base. Hilariously some of those that were trapped have over 2,000 hours on rust. We even ended up getting threatened with being raided if we didn’t remove the shotgun traps. Of course, we did no such thing because if some idiots want to raid an empty trap base, well go right ahead, enjoy your handmade shells I guess. Anyway, let’s take a look at how we build it, starting with the building and upkeep costs. As you can see this trap base is ridiculously cheap and even more so if you don’t bother honeycombing it. Now start off by putting two square foundations as low as possible. Build high triangle foundations around these. Upgrade everything bar the very first square foundation to stone and destroy the first foundation. You can leave it in if you want however it does nothing for the design and just adds to the cost. Next build walls on the inner perimeter of the high foundations, put a door at the end where we destroyed the foundation and make sure the opposite end is two half walls, now roof it off. After that we’re going to get the TC down in the corner here so that nobody can @#$! With you or the base. Now it’s up to you whether or not you want to honeycomb the trap base and add an airlock. Personally, I feel like it makes the whole thing more believable and makes anyone that you really piss off have to use more booms to get in. Lastly, we have to deal with the interior. I know it may seem excessive adding the furnaces and workbench however I really do think that it helped with the success of the trap base. It just made it feel like it was actually a base rather than just a trap. So, throw a workbench here next to the TC to block people being able to get past the traps on the off chance they manage to survive the firing squad. Now put two furnaces at the back, you don’t have to have them running, they’re mostly just there so the shotgun traps are less noticeable as well as making the base more believable. Next build a half wall here with the soft side facing the back of the base. This is so the shotgun traps can get through it more easily. After that’s in put your shotgun traps in as close to the half wall as possible and throw some handmade in them. Build a floor here and upgrade it to stone, it could actually just be wood however we don’t want people to have any suspicions, we want them to think this is a base that they’ve just managed to go deep on and run straight in. Now put a floor in and throw some unlocked large boxes up here. We opted to go with 3 of them so that you can have the front one facing out to show that they aren’t locked and entice people even more. Additionally, having them at this height draws their attention up and away from the shotgun traps. Lastly, we’re going to add a small box here and a sleeping bag as far over the edge as we can. The box is to slow them down as they come in so there’s no chance of them getting past the traps. The sleeping bag hides the shotgun traps perfectly from the entrance, even if the victim jumps to try and see what’s going on down there. That’s it. Now just run about farming, fire off an eoka a bunch of times, whatever you feel will bring people. Once they get there and start attacking you get to the trap base, throw the door open and let them kill you. I’d recommend leaving the inner door open that way you only need to get one door open before they kill you. I’d also recommend throwing a bag down in a nearby bush so you can get back to the trap base quickly to grab the loot and run off to your actual base. Speaking of which, do not build the trap base near your main base. You are going to piss someone off that will come back to raid and if they’re smart about it they’ll raid a base nearby rather than raiding the trap base. We even went as far as to have a small decoy base set up nearby just in-case anyone saw us running off with loot from the trap base. We’d store it in the decoy base temporarily and then once things cooled off a bit run it back to our main base. I know that may seem a little paranoid however a group we trapped did in-fact come back and raid the decoy base, so it was definitely worth it for us. Now for those of you that have been feeling bad for Bundy after the previous videos. You’ll be happy to know that after we finished up recording we had a chat and decided we couldn’t do it to him. We got Bundy on my discord and shortly after that he was officially part of our little gang. None of that guest code @#%$ either, he has full access to our bases and is more than welcome anytime he’d like to join us on any future wipes. So, Bundy, welcome to our little family of misfits and I personally hope you enjoy your stay. Lastly before we finish up here I want to quickly chat to everyone about charitable Rust. Now for those of you that haven’t heard of it, charitable Rust is a yearly charity event that is hosted and run by the team over at Rustafied. They do a 12-hour twitch stream and hold a number of in-game events with some very well-known special guests and there’s even prizes to be won. Since they started they’ve managed to absolutely destroy the previous year’s efforts and I’m hoping they can do the same again this time around. Each year they pick a different cause and this time it’s a charity called charity water. A simple name and cause though incredibly important as their mission is to get clean water to those in need. Clean water is a luxury that we all often take for granted such as the prick behind me. Actually, hold on. Okay sorry about that now where was I. Oh yeah right. Imagine for a moment that you had to cross the entire map to get some water and when you do it !$#%$ you up. Now imagine that we aren’t talking about water in a video game. 663 million people in real life don’t have access to clean water. They can’t just go to the tap and get a glass of water like we can. Take a minute to really think about that because it is absolutely [email protected]#!ed. Rustafied are hosting this event on the 17th of November and I’ll put a link to their site in the description. If you can spare a few bucks or even just check out the stream for a while it will genuinely help them. Anyway, that’s all from me this time around, thanks for watching and I’ll see you guys in the next video!